What is happening in the real economy is that inflation has hit the point at which corporations are raising prices to the degree than Americans are demanding higher wages to compensate. Wages and salaries rose 3.1 percent in the third quarter, the biggest increase in a decade, according to the Labor Department. Overall compensation costs were up 2.8 percent, ahead of Wall Street expectations. Wages have been the missing piece in the economic recovery, though the Fed has been raising rates to guard against future inflationary pressures. This represents the final stage of inflation seeping into an economy. This is why the Fed is so desperate to raise rates even if it blows up the stock market. 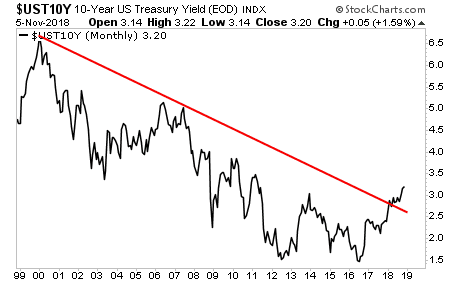 And it’s why the bond market is in SERIOUS trouble. And the bond market knows it. The bond market continues to blow up with yields on the ALL-IMPORTANT 10-Year US Treasury retesting their recent highs. This is a MASSIVE deal. This is effectively the bond markets telling the world that inflation is MUCH higher than most believe. And we’re now reaching the point at which junior debt instruments (risky corporate debt, auto loans, subprime mortgages) are beginning to blow up again. If you want a template for where we are right now, it’s “late 2007″… which means 2019 will be when the next crisis hits.